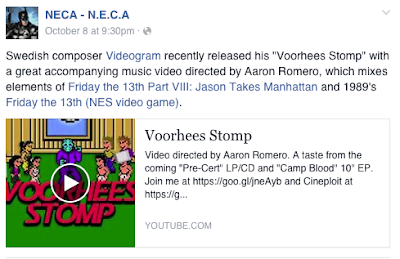 Videogram: NECA, The A.V. Club and more. Well, it's been a interesting couple of days to say the least! 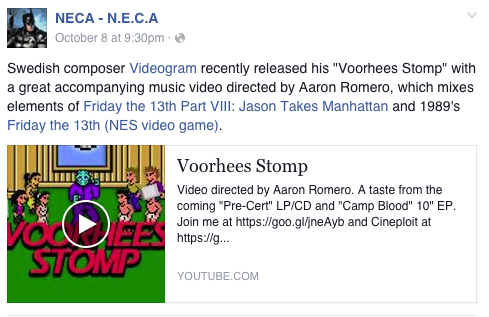 The reception for the Voorhees Stomp video has been amazing - and not only from the horror community. As you can see, U.S. merchandiser NECA gave it a much-appreciated shout-out on their Facebook page early on, which was quite thrilling for both me and director Aaron Romero. If you're even remotely interested in all things cult on TV, film, gaming etc. you're already familiar with the company. Have you seen their 8-bit video game Jason Voorhees 7" action figure? The A.V. Club gave it a write-up as well, and, to be perfectly honest, it was quite surreal seeing our work sandwiched between news about director Robert Rodriguez' coming project and America's Next Top Model. The humor of the video is coming across, as the article states that "The image of an 8-bit Jason Voorhees cutting a rug underneath a disco ball makes the video worth a watch all by itself." Next up, writer Michael Crisman over at Retro Gaming Magazine gave it a great write-up in his Voorhees Stomp: The 8-bit Video Hit article. Stating that the video (and track) is making "one hell of a splash in both the gaming and music scenes", Michael continues that "If you’re hosting a Halloween party this year, or have been tasked with providing the tunes for someone else’s, Videogram just might have what you’re looking for to make your next get-together a killer memory they’ll never forget." Much appreciated, Michael!